A very warm welcome from Teresa and Eugene, who made us feel at home in their lovely house near the Gap of Dunloe. Our only negative was that it was too isolated with regards eating out at night if you didn't want to drive. Theresa was very friendly and couldn't do more to please us ,she very kindly booked our trip for us to the gap we had lovely day.The room and breakfast were very nice and the views from the dinning room of the mountains were stunning,the only thing to make it perfect which we missed would be to have a tea tray in the room. Really lovely stay thank you . Everything was perfect, friendly staff, great location, perfect way to spend a few nights in Ireland! We were visiting the area to attend a family wedding at the local parish church. Theresa and Eugene were very welcoming making you feel very much at home. They are very knowledgeable about the locality even offering suggestions for locations for good locations for wedding pictures. We really enjoyed our stay at the Wayside. Mrs Ferris was very kind and friendly. Always helpful and obliging. The Location is perfect if you want to walk to the Gap of Dunloe. All rooms were lovely decoratet and clean. 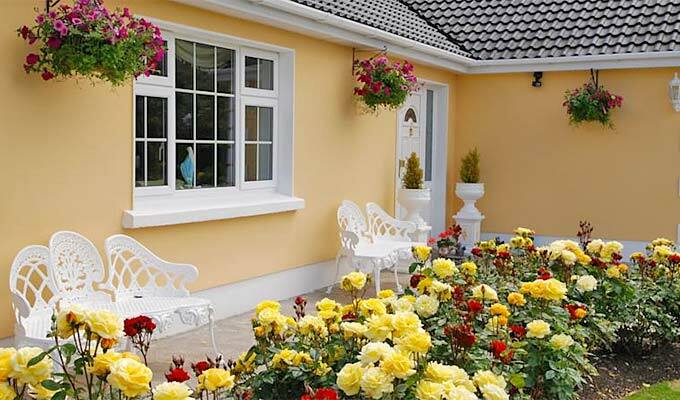 The expectation of an perfect irish B&B. Loaction was perfect on the entry of the Gap of Dunloe with 2 restaurants on walking distance. Breakfast was fine. Had a pleasant stay at the Wayside ~ had booked a double room but ended up with two singles ~ Theresa was very hospitable as was her husband and daughter. Beautiful breakfast full and plenty and extras was not a problem !! Visiting Kerry for a family wedding!! An excellent place to stay - very hospitable. Would have preferred the rooms with tea making facilities, but Theresa provided us with hot drinks in the guests lounge. Kate Kearney's Cottage just down the road was very handy for a good evening meal and live Irish music/dancing. Lots to see and do in the area. We would certainly stay here again. Excellent place, greatest hostest, you feel like you home in a friendly and familiar enviroment. Great food. Love it. Very nice place to tsay, just at the entry of the Gap : for the hill-climbers, no need a car. Near from the Purpple Mountain, Carrauntoohill, and for the restaurants : Kate Kearney's cottage and Beaufort. Very warm welcome from the hosts, always available for advices about local services taxis, restaurants, walks ... Very cleaned rooms and comfortable beds. Lovely home. Loved being close to the Gap of Dunloe. Gracious hosts. Very welcoming and beautiful setting. Best breakfast in all of Ireland!